Yamaha P115B Digital Piano Review – Is It Worth Your Money And Time? The Yamaha P115B is a high-quality digital piano that belongs to Yamaha’s P-class, which are currently the best-selling digital keyboards of all time. The new Yamaha P115B brings with it some rich new features that are an advantage over any of the existing offerings in the P-class lineup, which we will outline below in more detail. What Is the Yamaha P115B Digital Piano? As we have come to expect with the Yamaha P-class line, the new Yamaha P115B has proven itself as a quality keyboard that also has even more user-friendly features and even better sound quality than its predecessors. It’s quite compact, which makes it easy to take anywhere. Its USB connectivity feature is just another reason why it’s so portable – it’s the perfect keyboard for everything from outdoor or indoor performances to camping trips to daily home use. The Yamaha P115B also has a true to piano acoustic sound and 192 polyphony notes, which are two additional reasons we think it will be a favorite for everyone from beginners to pros. What makes the Yamaha P115B a standout digital keyboard? We think one of the most important features of any digital keyboard is its purity, clarity and authenticity of sound. Yes, there are many reasons why buying a digital keyboard may make more sense than buying a piano (space, cost and portability are a few that come to mind), but that doesn’t mean sound quality should have to be compromised. With its CF sound engine and the years of expertise built into any product coming from a trusted brand like Yamaha, consumers can feel secure knowing that authentic sound, dynamics and expressiveness are all important parts of the Yamaha P115B package. How did Yamaha get such an authentic sound? Yamaha’s famous CF III concert grand piano was used to create samples for the Yamaha P115B and built into Yamaha’s new state-of-the art CF sound engine, a first in class for Yamaha’s P-Series, which again yields unparalleled and true-to-piano sound. 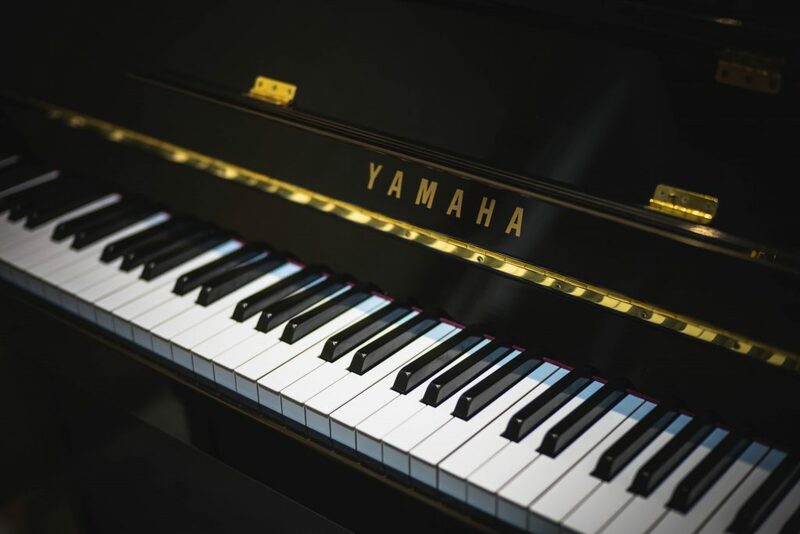 The Yamaha P115 B also features GHS (Graded Hammer Standard) technology, which means that players will also have the luxury of experiencing a true-to-piano touch. Some digital keyboards have an inauthentic and flimsy feel to the keys that make it harder to choose or play well with in a professional setting. The Yamaha P115B, much like the hammers inside a regular piano, have a heavier feel in the lower end and a touch that is lighter in the high end. Another unique feature is the ability to adjust the sensitivity level of these same keys; to personalize the experience for each player. This is helpful for pianists who are accustomed to playing a regular piano as it provides a parallel experience. This authentic touch helps new piano players who need to learn finger patterns and feel for the first time, as they will be able to effortlessly switch between this digital keyboard and a standard acoustic piano. Yamaha P115B also has an accompaniment feature that is helpful for turning solo performances into richer, more dynamic pieces. A player can simply input simple chord structures and then choose from the Pianist Style feature, which will automatically generate 10 different styles of rich accompaniment to any existing solo. It’s a great way to turn a very simple performance into more of a showstopper for audiences, and it’s also an interesting feature for aspiring music producers who may want to experiment with sounds to eventually build a track from the existing piece of music. On that same note, the Yamaha P115B comes with many different drum patterns to create rhythm and percussion for whatever the style of music and the occasion calls for. These different rhythmic elements can be added in while playing a piano tune or chords and even as a virtual drummer during a live performance. Speaking of performances, the Yamaha P115B has players covered when it comes to creating powerful ones. An auxiliary OUT jack is a wonderful addition to the Yamaha P115B because players can connect it to any external speakers or amplifier for a powerful outdoor or indoor performance or to cover large areas. The USB to HOST port that comes with the Yamaha P115B is also convenient for connecting this digital piano to any iPad or computer, which creates endless options for mixing it. The Yamaha P115B also comes with a sustain pedal; once again an important component for any person who wants to create a true piano experience on a digital keyboard. The Yamaha P115B can be purchased for around $600. Based on the weighted keys, key sensitivity system, USB and AUX ports, and the feature rich and intuitive interface, we give it 5 stars for ease of use. The Yamaha P-115B is the newest of the Yamaha P-line, which has a reputation for great sound, and more specifically, authentic piano sound. The Yamaha P-115B takes this authentic sound feature to the next level with Yamaha’s new state-of-the art CF sound engine, a first in class for Yamaha’s P-Series, which was created from a Yamaha CF III concert grand piano and yields unparalleled and true-to-piano sound. 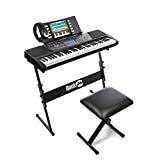 This is a sturdy instrument with superior craftsmanship, and it’s from a brand with a solid reputation as a digital piano leader. The design of the interface and the keys is both intuitive and authentic. Furthermore, the design quality makes is even more user-friendly for anyone from a beginner to a pro. A 3-year limited warranty is available with this product, but only if it’s purchased on Amazon. Because of this limitation, we gave it a lower rating. We find that the Casio Privia PX160BK shares many of the same features as the Yamaha P115B, so we will only highlight some of the main differences to avoid redundancy. It has a slimmer design than the Yamaha 115B, and there are 18 instrument sounds that can be played on these keys, ranging from grand piano to electric piano to bass to harpsichord. There are two headphone jacks and one USB port, for great connectivity. The Casio has 128 polyphony compared to the 192 polyphony sound of the Yamaha P-115B, which we think gives it less of an authentic piano sound: our main priority in a digital keyboard. It also has a bit of a flimsy sustain pedal and no digital display, which make it a bit less user-friendly than the Yamaha P115B. The price is a bit less than the Yamaha PII5B, but we think the difference in sound is worth the upgraded price on the Yamaha. It has a bit of a flimsy sustain pedal and no digital display, which make it a bit less user-friendly than the Yamaha P115B. It features two headphone jacks and a USB port, for optimum connectivity. We would like to see a more sturdy sustain pedal and a digital display feature on this keyboard. 1-year limited warranty included with purchase and 2-year additional warranty added after product is registered. The main differences between the RockJam 61 keyboard and the others are quality, features and price. This keyboard is more geared to a beginner player or someone who plays as a hobby. There are 61 unweighted keys on this board versus 88 weighted keys and the other models, and the sound is not nearly as authentic as the grand piano sound of the Yamaha P115B. There is no sensitivity to touch feature on the keys. The best feature, we think, of the RockJam is price. Are you unsure where your piano skills and you just need something to practice with? This might be a good choice. As we mentioned, this is a great beginner piano with a great price tag. While this is easy to use, it’s not authentic, so if you are looking to switch between a piano and a keyboard, a weighted keyboard will give the player a more user-friendly experience. There is no question that the Yamaha and Casio have the sound beat on this keyboard. It also does not have USB or AUX connectivity. The design is perfect for beginners, with an easy-to-read display screen and built in songs for practice. It’s not as versatile of a keyboard as the Casio or Yamaha though and would not be suitable for a professional. For the price, we think the warranty is fair. It boasts a 30-day money-back guarantee and a 1-year limited warranty. The Alesis Melody 61 keyboard is a step above the RockJam because it does have some USB connectivity and the keys are lightly weighted. If the choice is between the RockJam and the Alesis, we would personally go with this one. We think you get some bang for your buck, and it’s not something you have to feel overly committed to. We think this is easy to use and is a helpful digital keyboard for starters. This digital keyboard does not give you an authentic grand piano sound, but it’s decent for the price point and playing level it serves. It’s well designed for what it’s made for – it’s a beginner keyboard and it does have light-weighted keys, which is an advantage over some other digital keyboards at the same price point. We think the 1-year limited warranty is a fair warranty for the price of the product. 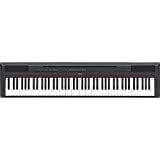 We think the Yamaha P115B is the most obvious choice if users are looking for a versatile digital keyboard that can take a player through all of his or her stages of piano playing. From beginners to professionals, the Yamaha P115B has something to offer everyone. The keys are weighted and feature the ability to adjust and customize key sensitivity, and the sound is very true, with samples coming directly from one of the best grand pianos available in the market. 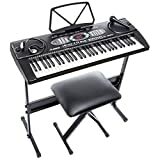 It's a serious digital keyboard, but it makes room for playful features such as rhythm and accompaniment, so it can use for both budding arrangers and producers and also those who use it professionally by connecting to software programs through USB such as Pro Tools, Logic, or more beginner programs like GarageBand. It's possible to use on both Mac and PCs systems as well. For the price, authentic sound, connectivity and portability, we think you cannot go wrong with purchasing and committing to the Yamaha P115B.